Full-disclosure: fairly new to QGIS (v3.4), and I am currently styling a map for presentation. I'm trying to match colors within data contained on a layer using "Categorized" styling, so that I can differentiate hierarchy between State/Local/Private/etc roadways, and also do this between discrete layers. It seems like the way to do this would be to create a "New Palette" of swatches within the "Change Symbol Color" dialogue. Normally, I would expect this would allow me to save a dozen color swatches I like, and then load this palette when styling another item, either within the same layer, or another item on a different layer - but that does not seem to be the way it works. Instead, I find the palette which I've saved, but it is empty with no contents (???). Is this a bug or an environmental variable thing? Do I need to export/save the palette outside of QGIS and load it for each different layer? This seems like a total P.I.A. Anyone else experience this or have a workaraound solution? It seems I was just looking in the wrong place - there is in fact a way to setup project-level color palettes in QGIS, but it is in a different spot. If you go to Project -> Properties -> Default Styles this will let you setup symbology defaults for different types of geometry and color-ramps and color palettes too! Once you do this and save it, your new custom palette will automatically show up in your symbol color-pickers! I'm not sure exactly where you're seeing a "change symbol color" dialog, but here are a few different ways to save colors and use them again later. You can add pre-defined colors to the project from the Project menu > Properties > Default Styles. You can apply project styles to features from the select color interface > color swatches tab > choose "project colors" from the dropdown menu. Notice that in the same interface, you also have the option to choose from recent colors. 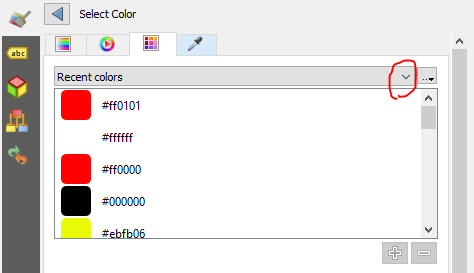 So you can actually skip the step of saving colors in the project menu, and just use recent colors. 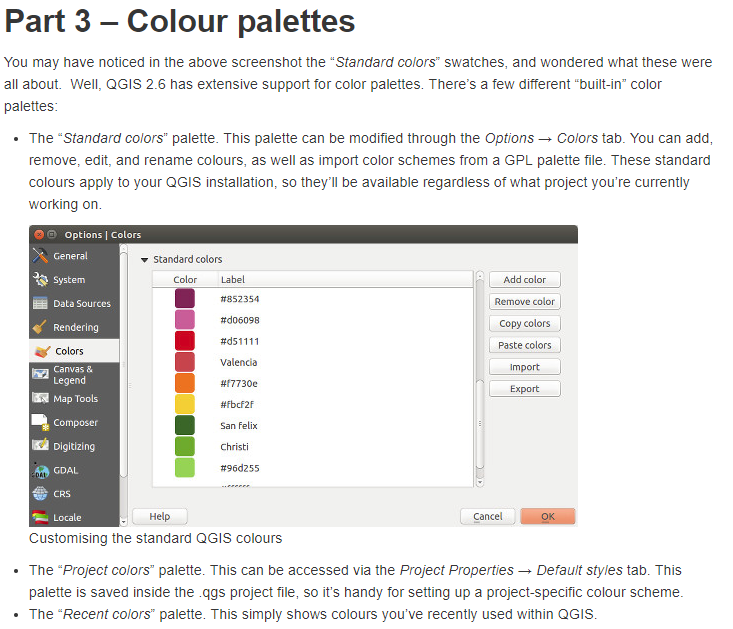 Notice that you have access to recent colors, standard color palettes, and project colors. The QGIS-3 series has an enormous number of different ways to customize the symbology of your layers. 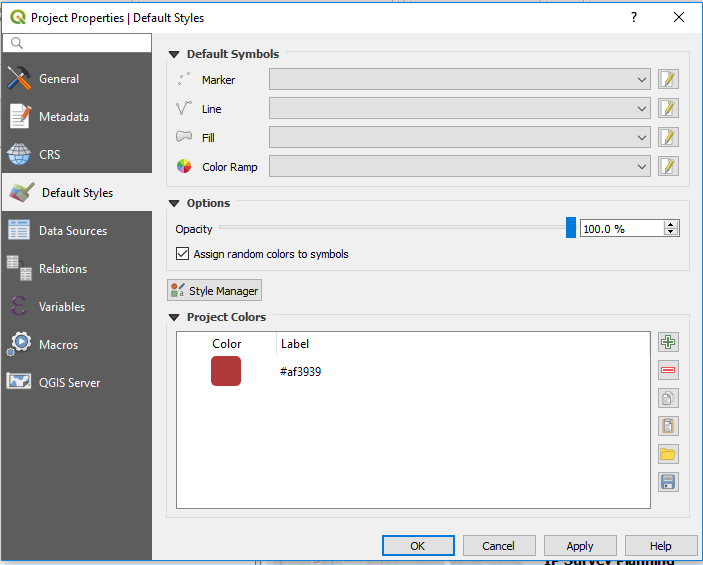 See the The Style Manager section of the QGIS User Manual. Not the answer you're looking for? Browse other questions tagged qgis style color or ask your own question. Styling point displacement for 2 variables QGIS? Saving a WFS layer directly to the disk using QGIS or PyQGIS?